As well as voicing one of the characters in Dreamworks Animation's upcoming Home, alongside Jim Parsons, Rhianna, and Steve Martin, Jennifer Lopez lends her vocals to the movies official song, Feel The Light. Watch the lyric video below, which features footage from the movie, below. 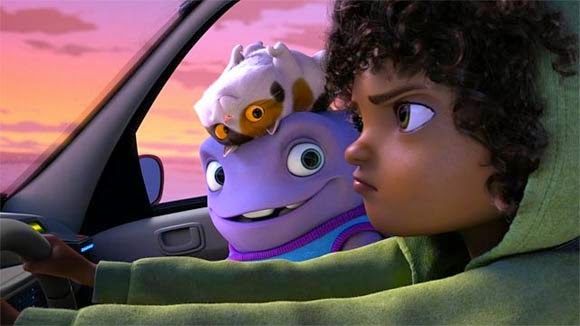 Synopsis: When Oh, a loveable misfit from another planet, lands on Earth and finds himself on the run from his own people, he forms an unlikely friendship with an adventurous girl named Tip who is on a quest of her own. Through a series of comic adventures with Tip, Oh comes to understand that being different and making mistakes is all part of being human. And while he changes her planet and she changes his world, they discover the true meaning of the word HOME.